Staples High School students participated in the CMEA Western Regional Music Festival on Jan. 11-12. The second annual Connecticut Guitar Festival will take place Feb. 2-10. This festival rallies multiple genres of music around a common element: the guitar. The festival involves an entire week of education, entertainment and exposition, highlighting classical, rock, jazz, blues, and world music, through a series of ticketed and free events at multiple venues. All ages, styles, and abilities are welcome. The festival opens on Feb. 2 with a performance by internationally renowned guitarist Mak Grgic at Westport Arts Center, as well as a master class by Grgic at Suzuki Schools’ Westport campus earlier in the day, followed by a weeklong presence of guitar education at Westport Library. On Feb. 8, The Bijou Theatre will host the Connecticut Guitar Festival Weekend Kickoff concert featuring Guitar Hall of Fame legend Arlen Roth and Yale Music School’s Benjamin Verdery. The show will open with performances by students from Paul Green’s Rock Academy and the Suzuki Music Schools’ Guitar Ensemble. On Feb. 9, there will be events at dual venues. There will be a recording clinic at Norwalk — CT’s Factory Underground Studios hosted by producer Kenny Cash — followed by rock and blues guitar workshops with Arlen Roth and Paul Green. Participants must register through the festival website. The fee is $25. Also on Feb. 9, for guitar fans both young and old, the Westport Library presents Japanese guitarist and storyteller Hiroya Tsukamoto performing a poetry and music concert at Suzuki Music Schools’ Westport Blake Recital Room. Free and open to the public. No ticket required. On Feb. 10 at Suzuki Schools Westport , a $25 admission fee grants access to a day of master classes and workshops by guitarists Benjamin Verdery, David Madsen, Joe Kiernan, Drew Pinto, and Javier Farias, as well as admission to expositors and luthiers. The school reopens to the public at 3 p.m. for an Alturas Duo Pillow Concert, featuring new work by Dr. Gwyneth Walker that will be premiering at the performance, and is part of a New Music USA project grant. Following the Alturas Duo concert, a group of instructors from the day and a group of local students will perform a rendition of a Javier Farias composition requisitioned for the festival and led by Farias. Twenty-one students from the Staples High School Music Department participated in the CMEA Western Regional Music Festival on Jan. 11-12. Staples students participating were: Lucy Belknap, Justin Berg, Zachary Bishop, Calvin Carson, Nicholas Denton-Cheng, William DeRocco, Lucas Flood, Anella Lefebvre, Annie Liu, Neha Navrange, Abe Rubin, Matthew Davis, Woongki Hong, Jacob Kitchner, Sophia Lauterbach, Elana Atlas, Caleb Kitchner, Preston Lust, Maximus Pace, Caroline Russell and Benjamin Schussheim. 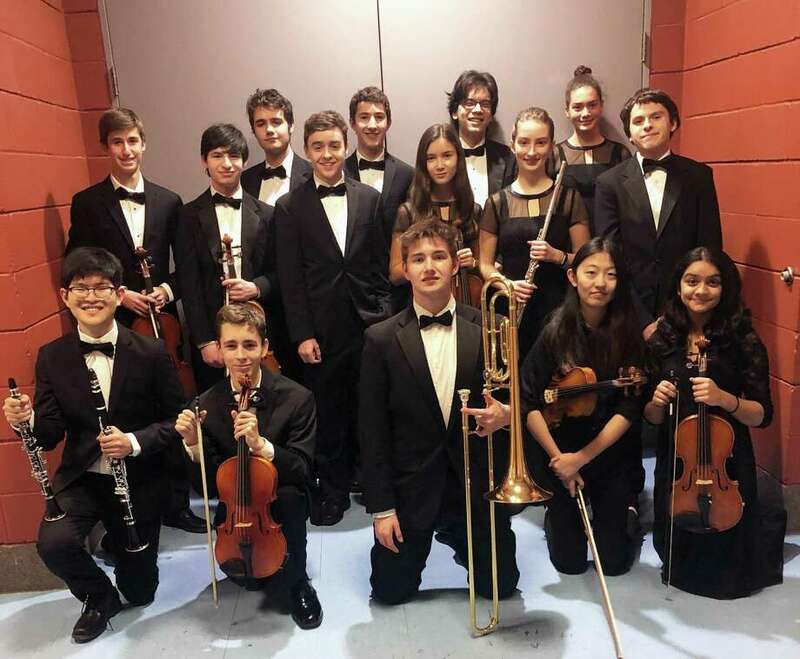 The festival, hosted by Darien High School, involved 33 schools and approximately 400 students from the western part of Connecticut. Musicians rehearsed the evening of Jan. 11 and during the day on Jan. 12, followed by concerts the same day. The Friends of the Westport Center for Senior Activities will be hosting the 11th annual Super Bowl Tailgate Party on Feb. 3 from 1 to 4 p.m.
Ceremonies will begin at 2 p.m. and is open to community members of all ages. The festivities will be honoring the Staples State Champion Girls Field Hockey team. Helping to keep spirits high will be the Staples varsity cheerleaders and the PAL cheerleaders. As always, there will be a “guess the final score” contest, plus games and prizes. An award for Service to the Senior Center will be presented to Lynn Goldberg for her leadership of the enhancement project. To round out the party, there will be chips and dips, hot dogs with all the fixings, cake and beverages. The following Westport reisdents have been named to the dean’s list at the University of New Hampshire for the fall 2018 semester: Lily Kalman, Zachary Howard, Ethan Steuer, Sarah Mahoney and Sophia Henkels. The following Westport residents have been named to the dean’s list at Eastern Connecticut State University for the fall 2018 semester: Nicholas Diaz, Angelique Greenberg and Tyler Wright. Charlotte Steinberg, of Westport, was named to the dean’s list for the fall 2018 semester at Ithaca College. The following Westport residents were named to the University of Delaware dean’s list for hte 2018 semester: Julie Bender, Kathryn Petersen, Rachel Stanford, Noah Schwaeber, Cassidy Krulewitch, Caroline Keenan, Ashton Dedona, Charlotte Revelli, Andrew Woods and Meghan Johnson. Westport resident Daniel Menachemson was named to the fall 2018 semester sean’s list at Lasell College. The following Westport residents were named to the fall 2018 semester dean’s list at the University of Wisconsin-Madison: Fleur Byrne, Lindsey Felner, Matt Greenapple, Emily Greenberg, Alison Morrison, Sara Parower, Robin Ritchey, Elizabeth Sila and Grace Wynne. Westport residents Andrew Taets, Skyler Celotto, Jessica Pressman and Tamar Friedman were named to Emerson College’s fall 2018 semester dean’s list. Yael Dror, of Westport, was named to the fall 2018 semester dean’s list at the University of Albany. David Kalinowski of Westport was named to Muhlenberg College’s fall 2018 dean’s list. Sarah Lepisto, of Westport, was named to the fall 2018 dean’s list at American International College in Massachusetts. Jane Handa and Aaron Leopold, of Westport, were named to the dean’s list at the College of William & Mary for the fall 2018 semester. Anna Rozier, of Westport, was named to the fall 2018 dean’s list at McDaniel College. The following Westport residents were named to the Worcester Polytechnic Institute dean’s list for the fall 2018 semester: Kyle Ehrlich, Conrad Mera, Christopher Martenson and Joseph Montuoro. Alexander Bloch and Jonathan Maisonet, of Westport, were named to the fall 2018 dean’s list at the University of New Haven. The following Westport residents were named to the fall 2018 dean’s list at Bucknell University: James Ciquera, Cecily Hutchison, Noah Prince and Sara Zurmuehle. Sara Jadbabaie, Peri Kessler and Brooke Kessler, of Westport, were named to the fall 2018 dean’s list at Hamilton College. Kaela O’Kelly of Westport, was named to the fall 2018 dean’s list at the University of Rhode Island. Megan Doyle, of Westport, was named to the dean’s list for the fall 2018 semester at the University of Vermont. The following Westport reisdents were named to the Lehigh University dean’s list in fall 2018: Matthew Addessi, Sarah Duvall, Sophie Epstein, Evan Hruskar, Jackson Livingstone, Renee Reiner and Anna Sivinski.